The city of Sidi Ifni was incorporated into the Spanish colonial empire in 1860. The following decades of Franco-Spanish collaboration resulted in the establishment and extension of Spanish protectorates south of the city; Spanish influence obtained international recognition in the Berlin Conference of 1884. In 1946, the region's various coastal and inland colonies were consolidated as Spanish West Africa. 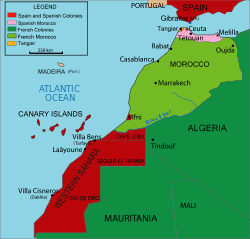 Immediately following its independence from France in 1956, Morocco began expressing interest in the Spanish possessions, claiming it was historically and geographically part of Moroccan territory. Violent demonstrations against Spanish rule erupted in Ifni on April 10, followed by civil strife and widespread killings of those loyal to Spain. In response, Generalissimo Franco dispatched two battalions of the Spanish Legion, Spain's elite fighting force, to El Aaiún in June. Spanish military mobilization resulted in the Moroccan army converging near Ifni. On October 23, two villages on the outskirts of Sidi Ifni, Goulimine and Bou Izarguen, were occupied by 1,500 Moroccan soldiers (Moujahidine). The encirclement of Ifni had begun. Two more Legionary battalions reached the Spanish Sahara before the opening of hostilities. At Tiluin, 60 Tiradores de Ifni (locally recruited indigenous infantry with Spanish officers and specialist personnel), struggled to hold off a force of several hundred Moroccans. On November 25, a relief attempt was authorized. Five CASA 2.111 bombers (Spanish-built variants of the Heinkel He-111), bombed enemy positions, while an equal number of CASA 352 transports (Spanish-built versions of the Junkers Ju-52/3m) dropped a force of 75 paratroopers into the outpost. Initial Moroccan attacks had been generally successful. In the space of two weeks, the Moroccans and their tribal allies had asserted control over most of Ifni, isolating inland Spanish units from the capital. Simultaneous attacks had been launched throughout Spanish Sahara, overrunning garrisons and ambushing convoys and patrols. 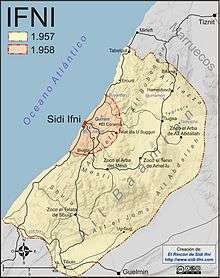 Consequently, Moroccan units, resupplied and greatly reinforced, tried to surround and besiege Sidi Ifni, hoping to incite a popular uprising. However the Moroccans underestimated the strength of the Spanish defenses. Supplied from the sea by the Spanish Navy and protected by kilometers of trenches and forward outposts, Sidi Ifni, boasting 7,500 defenders by 9 December, proved impregnable. The siege, lasting into June 1958, was uneventful and relatively bloodless, as Spain and Morocco both concentrated resources on Saharan theatres. In January 1958, Morocco redoubled its commitment to the Spanish campaign, reorganizing all army units in Spanish territory as the "Saharan Liberation Army". On 12 January, a division of the Saharan Liberation Army attacked the Spanish garrison at El Aaiún. Beaten back and forced into retreat by the Spaniards, the army turned its efforts to the southeast. Another opportunity presented itself the next day at Edchera, where two companies of the 13th Legionary battalion were conducting a reconnaissance mission. Slipping unseen into the large dunes near the Spanish positions, the Moroccans opened fire. Ambushed, the Legionaries fought to maintain cohesion, driving off attacks with mortar and small arms fire. Notable fighting was seen by the 1st platoon, which stubbornly denied ground to the Moroccans until heavy losses forced it to withdraw. Bloody attacks continued until nightfall, and were fiercely resisted by the Spanish, who inflicted heavy casualties. By nightfall, the Moroccans were too scattered and depleted of men to continue their assault, and retreated into the darkness. In February 1958, a Franco-Spanish combined force launched an offensive that broke-up the Moroccan Liberation Army. Between them France and Spain deployed a joint air fleet of 150 planes. The Spanish were 9,000 strong and the French 5,000. On February 10, the 4th, 9th, and 13th Spanish Legion battalions, organized into a motorized group, drove the Moroccans from Edchera and advanced to Tafurdat and Smara. On April 2, the governments of Spain and Morocco signed the Treaty of Angra de Cintra which was named after the large bay in the area. 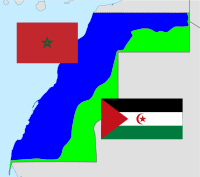 Morocco obtained the region of Tarfaya (Cape Juby), between the river Draa and the parallel 27° 40′, excluding the colonies of Sidi Ifni and the Spanish Sahara. 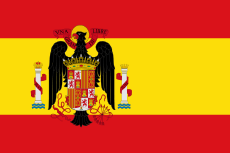 Spain retained possession of Ifni until 1969, when, while under some international pressure (resolution 2072 of the United Nations from 1965), it returned the territory to Morocco. Spain kept control of Western Sahara until the 1975 Green March and the Moroccan Army invasion prompted a withdrawal. Santamaría, Ramiro. Ifni-Sahara, la guerra ignorada ("Ifni-Sahara, the Ignored War") Dyrsa, Madrid, 1984. The history of the Ifni war told by a specialized journalist in the Western Sahara. Tamburini, Francesco. "Ifni-Sahara, 1957–1958: una guerra coloniale dimenticata" ("Ifni-Sahara, 1957–1958: a forgotten colonial war"). Eserciti e Storia, no. 42, a. VII, July-August 2007.